We put Apple's new iPad Pro to the test. Here's how to know if the flashy device is worth the pricetag. This past week, Apple changed course and used its annual developer conference to unveil some sleek new devices, in addition to its expected software updates. While the smart HomePod speaker stole much of the attention (and introduced instant Amazon Echo comparisons), Apple also unveiled new iPad Pros. [post_ads]As someone who has always been somewhat skeptical of tablets — if I have a laptop and smartphone, do I really need to shell out $649 for another screen? — I was curious to see if the Pro was useful enough to change my mind. Ahead, take a look at how it performed under pressure to determine if it's a worthwhile investment for you. The 10.5-inch iPad Pro (starting at $649) is a brand new screen size for Apple. Good news: Even though it's a bigger size (the screen is 20% larger than the smaller, 9.7-inch model), your iPad doesn't weigh more. It's still just a pound, making it as portable and easy to toss in a bag as ever before. The iPad Pro's display is the device's standout feature. Apple said the retina display on the 10.5-inch model would be 20% brighter and have 40% less reflectivity. When I took the Pro outside on a sunny, 90-degree day, it was remarkable just how clearly I could still see everything onscreen. Sure, there was some glare, but it was easy to read articles and look at photos while lounging in the grass, without the sun getting in my way. Consider the Pro prepared for your beach-day reading agenda. The iPad Pro features a wide color gamut, making for a game-changing streaming experience comparable to in-theater entertainment. It's also an especially nice device to use when you want to edit photos. The apps that are best on the iPad are those that have been specifically designed for the device, rather than ones like Instagram that have simply been enlarged from how they appear on the iPhone. Apple previewed the cool editing effects of the Affinity Photo app during its WWDC Keynote, so this was the one that I decided to test out for myself. I'm no pro photographer, but the richness of color that showed up in my photos on screen (like this one, of some Williamsburg street art) made me feel like one. The combo of a wide color gamut and larger screen makes the experience of working with apps like Affinity far more immersive on the iPad Pro than on iPads past. I always laugh when I see people holding up their iPads to take photos in museums or outdoors, but when I see someone using a new iPad Pro I'll understand why. The resolution is incredible, thanks to a 12-megapixel camera with optical image stabilization. When standing on my rickety fire escape taking this photo, I could focus more on the garden below and worry less about my shaky hand. It's also easy to take live photos and and 4K video within the camera app. Like Microsoft's Surface Pen, the Apple Pencil ($99) responds like a real-life pen or pencil. If you push harder on the screen, you'll get a thicker line just as you would when using a pencil on paper, thanks to a force sensor inside the tip. Granted, the thickness is very slight, but it is nice to see that kind of responsiveness on screen. I still prefer the feel of the Surface Pen to the Apple Pencil, though. It seems lighter and more natural to hold and write with. Plus, unlike the Pencil, the Pen doesn't have to be charged. If you want to use the iPad as a replacement for your laptop, you'll need Apple's Smart Keyboard ($159). The keyboard attaches via a "Smart Connector" along the left-hand side of the device that, conveniently, transfers power and data automatically so that you don't need to charge or pair it. The keyboard also props up the iPad Pro when you're streaming a show and and folds over the screen as a protective cover. The Keyboard serves its purpose, but I'm not in love with it. The keys feel heavier to type with than I'd like, and I miss having a trackpad with the keyboard. Having to switch to using the pencil or my finger anytime I wanted to move elsewhere onscreen interrupted the flow of my work. Also, I wouldn't advise picking up your iPad by the keyboard. All it took was a slight shake for my iPad to fall off onto the couch below. The iPad Pro features something called ProMotion technology, which means that pages refresh at a much faster rate. As a result, articles and images load much more quickly than I'm used to on other devices. There's barely any lag time when scrolling through a site online, save for a split second here and there. The speedy loading time was especially impressive in apps such as Google Maps. On my iPhone and laptop, I'm used to waiting a few seconds for part of the map to appear in detail onscreen. On the iPad Pro, moving from one section of the map to another — either with my finger or the Pencil — was seamless. Like all Apple products, the iPad Pro is a beautiful device that's sleek to look at and, with upgrades in speed and color range, even more beautiful and impressive to use. After a day spent streaming a two-hour movie, editing photos with Affinity, and periodic online shopping, my iPad's battery was still at 74%. Personally, I'd be more apt to use the device at home than at work. This is largely because I'm not in love with the Smart Keyboard and would much sooner type on my laptop. I'll be interested to see if the upgrades that come with iOS 11, including ones that let you use the Apple Pencil to instantly markup documents, sign PDFs, and draw within Notes, change my mind at all. 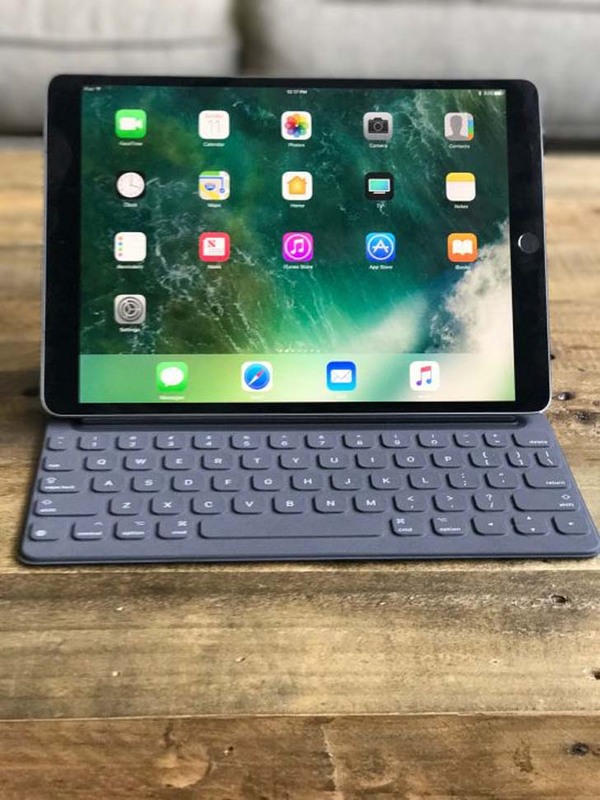 But for now, if you want a portable device for reading, streaming shows, or viewing and editing photos, you can't do much better than the iPad Pro.